Construction: rotary vane pumps with oil lubrication made in single and two stage versions. Check valve built into the oil inlet flange and manual gas ballast valve for humidity. Performance: Due to the scope of these pumps can quickly reach the final vacuum level drastically reducing emptying compared to previous models. Pumps and quiet with low vibration. Easy installation: the weight and the accessories (handle, base plate, electric cable and switch) ensure easy transportation manual for maintenance exterior and its small size allows installation of systems and equipment on board . Multiple applications: pumps have been studied for use in the field of refrigeration and air conditioning They are ideal for applications that need to get a good grade with final vacuum cycles average long as vacuum stove, primary pumps in vacuum, vacuum furnaces for the jewelry or dental purpose is instruction or associated with laboratory instruments. Reliability: all mechanical and electrical components are designed for continuous operation, even 24 hours on 24. 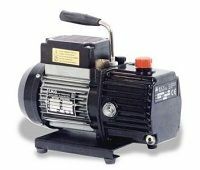 The pump is supplied with the vacuum gauge connected and without fittings. As an accessory you can buy the oil separator filter that eliminates even every little smoke due to the non-perfection of the bag.